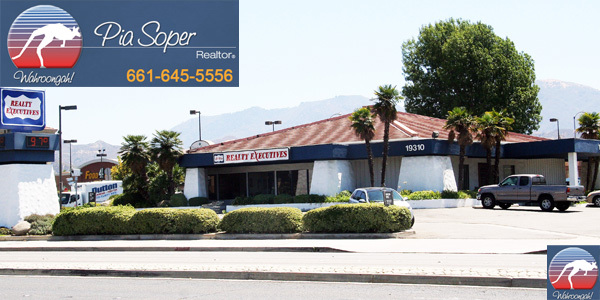 The Realty Executives Canyon Country CA office is located at 19310 Soledad Canyon Rd., Canyon Country, CA 91351 and serves the real estate needs of the the area of Canyon Country CA within the city of Santa Clarita CA in the Santa Clarita Valley. For directions and more information on Canyon Country CA, please call me at 661 645 5556. Since I am a long term resident (from 1981) of Santa Clarita CA, and a proud Realty Executives real estate agent in Canyon Country CA, you will benefit from my years of accumulated knowledge about life in Canyon Country CA. Whether you are buying or selling a home or an investment property, it is important to choose an experienced Realty Executives Canyon Country CA agent who can help you avoid expensive pitfalls. As a real estate agent in Canyon Country CA with over 25 years experience in the area, you can trust me to help you make the best decisions to achieve your goals. A well planned and fully executed marketing plan which will sell your home for the highest price possible, in the least amount of time, with minimum hassle to you. Please allow me as your agent at Realty Executives Canyon Country CA show you a marketing plan that will work for you. A thorough understanding of the market place prior to purchasing your new home. Knowing whether a market is favoring a buyer or seller is not enough. Please allow me as your Realty Executives Canyon Country CA agent provide you with the greatest chance to have your offer accepted.